Daysi Camejo Fiffe of Baracoa is a typical Cubana. She is hospitable, vivacious and kind. She smiles broadly. And yet, the plump, flamboyant Daysi stands out from the crowd. Apart from her day job at the local secretary’s office, where she’s been managing confidential documents for the past 32 years, she brings in extra income by renting her home, in what is known in Cuba as a casa particular. “We are ecstatic with this notición (extraordinary news) from your President. December 17th will always be an unforgettable day for us, Cubans,” said Daysi by email few days after the historical announcement. President Obama's sweeping December announcement to restore diplomatic relations with the once forbidden island has opened the doors to Cuba a little bit wider. 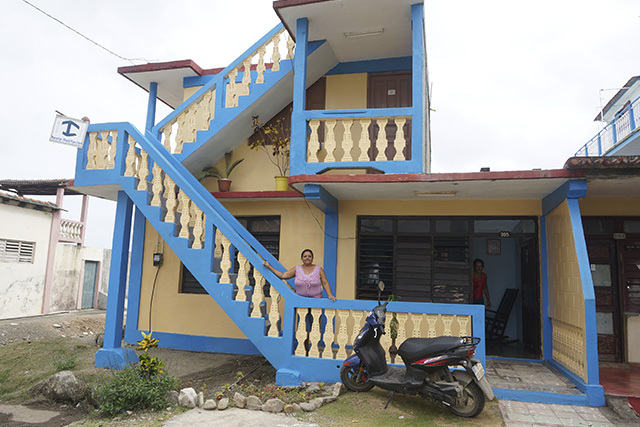 Homeowners like Daysi are hoping to host American tourists. As of today - despite the new regulations - the only legal way for Americans to travel to the island remains via organized people-to-people tours with companies like insightCuba. Boasting a large terrace overlooking the sea, the merry blue and yellow hues of her house blend in with the blues of the sea, and yellow rays of the sun. Inside, similar colors inspire a matching Caribbean look and feel, a Cuban nautical motif of sorts. For 20 CUC a night per room (1 CUC is the equivalent of 1 US dollar), European tourists mostly – predominantly Italian, Spanish, and French – cohabitate with Daysi, while they roam through the easternmost province of Cuba, Guantanamo. More often than not, Guantanamo evokes sentiments of hostility and isolation. While certainly off the grid, Daysi’s hometown, the region’s undiscovered gem, does not. Like few places in the world, Baracoa offers a bit of everything. Cuba’s first settlement and once its capital overflows with natural beauty (an abundance of rivers, mountains and beaches), with cone-shaped palm leaves filled with sweetened coconut - the local delicacy known as the cucurucho - and the best treat of all, with generous amounts of chocolate production. She’s lucky. Her house is right on the beach. Today, it is no longer allowed to build any cement and blocks house less than fifty meters from the sea. The reason is simple: to prevent storm devastation. Although the two major hurricanes Ike and Sandy ravaged through the Caribbean island, her house remained in good condition. Luck struck again, for there is no flood insurance in Cuba. In recent years, selling and renting houses has been more loosely accepted in Cuba. Signs of Se vende esta casa (house for sale) can be seen ever more often. How will the new White House regulations change the lives of small business owners like Daysi remains to be seen. One thing is clear; decades of isolation haven’t inhibited their desire to get out into the world. Cubans are learning. Cubans are adapting. “It’s only 14 CUC/ night if tourists stay for a month or two, and 15 CUC/ night if for a week. The Italian currently staying on the second floor is here for a month,” Daysi explained. The fee includes accommodation in one of the two upstairs bedrooms (she lives on the ground floor), and breakfast; a private, Cuban bed & breakfast, if you may. She also provides a TV, AC and hot water, but no Internet. For modern day dwellers, scarcity of Internet access throughout Cuba remains a problem. Only 5% of the island’s eleven million population is currently connected. While infrastructure is expected to improve in the upcoming months, most probably years, as of today, only journalists have Internet at home. As for landlines, only 40% of the Cuban population can attest to that. While Daysi checks her email from work, most others don’t have that luxury. Besides replying to Internet inquiries, she promotes her rental business through the infallible word of mouth and through a stamp on her door that reads house for rent. “A German tourist put my house on Trip Advisor,” Daysi said. Despite her apparent higher standard of living, life doesn’t come easy. Her daughter, a 26 year-old doctor, lives and works in Venezuela. Cuba’s medical schools provide some of the best doctors in the world, but the average income of 25 to 30 CUC a month doesn’t suffice to live, not even in Cuba. “Life in Venezuela is dangerous. But she earns much more there. She hopes to come back to Cuba and buy a house. But until then, she has to make sacrifices - the price of a house is very high,” Daysi continued. Taxes are also a factor. The land on which the house rests was given from her father in law, however the state ultimately owns the house. She has to pay roughly 60 CUC a year in tax, as well as 10% on her monthly earnings. 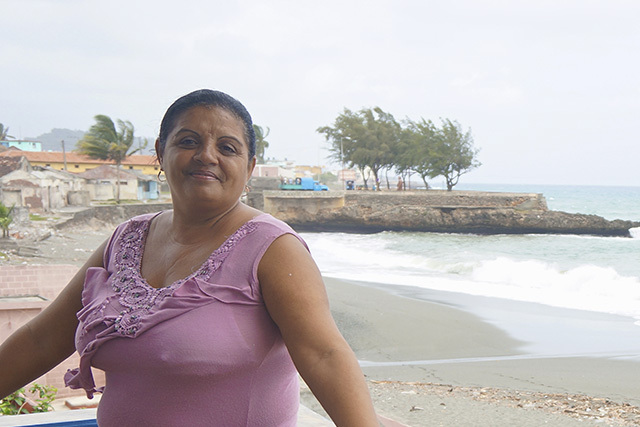 As she gazes over to the sea, from her beautiful terrace, Baracoa’s waters are shimmering. Despite everything, Daysi is counting her blessings. The people of Baracoa are poor. But their souls are immensely rich. Their doors are always open. This is partly why tourists feel so welcome here – thankfully, Baracoa is not overrun with tourists yet – initially allured by the region’s rich UNESCO Biosphere reserve and the majestic Yunque plateau, they ultimately stay for the people’s warmth, their familiarity on the streets and the contagious good mood. Still, some Cubans with lifelong dreams to flee the island put their house for sale in hopes for a new life, elsewhere. Daysi, however, is here to stay. Her house remains open for guests.